Deciding between a co-brand or a bank-issued miles card? Learn about the key differences between the two first. Co-brand cards are jointly sponsored by a financial institution and a retail merchant. Diners Club is probably the king of co-brand cards in Singapore- a quick glance at their website shows offerings like the Diners Club Mustafa credit card, the Diners Club Secret Recipe credit card, the Diners Club Nature’s Farm credit card and so on. 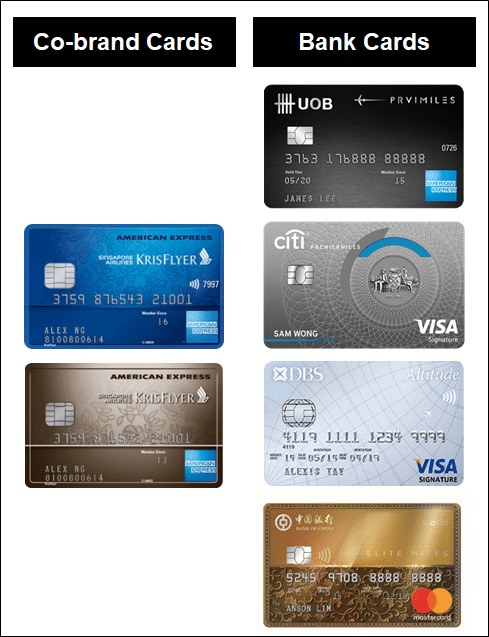 In the miles space, the main co-brand card issuer is American Express with its KrisFlyer credit card portfolio (technically there’s also the KrisFlyer UOB Debit card, but let’s pretend that doesn’t exist). A reminder that The Milelion is partnering with AMEX to give away 10x prizes of 100K miles each for successful applicants of the AMEX KrisFlyer Credit Card and AMEX KrisFlyer Ascend. Simply get approved before 15 May and spend at least $1 by 31 May to be eligible for the draw. Full T&C here. Read more at this link. Bank cards are unaffiliated with any particular retail merchant. In the miles space, this would include the BOC Elite Miles World Mastercard, Citi PremierMiles Visa, DBS Altitude and so on. Co-brand and bank cards work slightly differently when it comes to earning and burning miles. In the sections below, we explore some of the differences between the two types. When you use an AMEX KrisFlyer co-brand card, the miles you earn automatically appear in your KrisFlyer account a few days later with no transfer fees involved. When you use a bank card, remember that you’re not earning miles per se, you’re earning bank points (e.g. UNI$, DBS Points, Citi Miles). These points can be converted into frequent flyer miles, but you need to pay a conversion fee of ~$25 when you want to do so. The implication of AMEX KrisFlyer co-brand cards crediting points directly to your KrisFlyer account is that the three year KrisFlyer expiry countdown starts immediately. Depending on how fast you accumulate miles and how often you redeem them, this may or may not be a problem. On the other hand, using a bank card allows you to decide when you want to transfer points into KrisFlyer. This effectively extends your expiry window, because you enjoy validity on both the bank side, and the KrisFlyer side. What’s more, the points earned on certain bank cards don’t expire (e.g DBS Altitude, Citi PremierMiles). Instant transfers on co-brand cards are both a blessing and a curse. On the one hand, your expiry countdown starts straight away. On the other, your miles are always ready for use. Those with bank cards may encounter the following scenario: Imagine you’re looking for award space and you finally find the flight you need. The problem is: your points are on the bank side. By the time you transfer them into KrisFlyer, that award space may be gone (you can try and call KrisFlyer membership services to ask for an award hold, but it’s not official policy and YMMV). Cue anxiety while you refresh your account every day waiting for your miles to pop up. The good news is that although most banks quote a 1-2 week conversion time, in reality you should see your miles in 3-4 working days at most. It’s still not instantaneous, though. Generally speaking, bank cards enjoy better miles earning rates than co-brand cards. For example, the AMEX KrisFlyer Ascend and AMEX KrisFlyer Credit Card earn 1.2 and 1.1 mpd on local spending respectively, below the 1.2-1.5 mpd offered by bank cards. You also won’t find 10X opportunities on co-brand cards. These are only available through cards like the Citi Rewards Visa and the OCBC Titanium Rewards. That said, AMEX has recently added numerous opportunities for cobrand cardholders to earn bonus KrisFlyer miles at selected merchants. This helps to even the score a bit, although it’s worth noting that most of these bonuses are capped. Here’s a summary of the sign up bonuses offered by co-brand (blue) and bank (yellow) cards. Remember that you can always see a summary of ongoing sign up bonuses at this page. Bank cards may have the beating of co-brand cards when it comes to day-to-day spend, but when it comes to sign up bonuses, the latter pack a big punch. The largest sign up offers (in terms of absolute number of miles) on the market right now are offered by the AMEX KrisFlyer credit cards. The main drawback is that they also have the highest spending requirements at $10K and $20K respectively. The other aspect you want to consider is eligibility- most of the bank sign up offers do not apply to existing customers, so if you already hold any of their credit cards, you’re ineligible for a sign up bonus. The AMEX co-brand cards do not have any such condition- so long as you don’t already hold that particular card, you’re eligible for the sign up bonus (the 5K first spend bonus is only available to first-time cardholders, though). It seems a bit silly to say this, but obviously co-brand cards only let you transfer miles to that particular airline. Bank cards offer transferable points currencies, with up to 12 different airlines available. Here’s a list of transfer partners, by bank. As we cover in Alternative Frequent Flyer programs, there will be situations where you’ll want to consider FFPs other than KrisFlyer because it represents better value for your points. As I alluded to in the introduction, this may be a bit of a false choice because there’s nothing stopping you from holding both co-brand and bank issued cards. That said, it’s helpful for those just getting into the miles game to know the meaningful differences between both kinds. Whether you’re getting a co-brand or bank card, be sure to check out the latest sign up offers that are available for Milelion readers. I think you miss out one key point of converting bank card point to krisflyer point. The point is convert in batch. For example, DBS need to have at least 5000 dbs points in order to convert to miles. What’s irritating is that you might have some odd point such as 4995 dbs points and you could not convert it. this is a great point too. you want to keep batch conversions in mind. The conversion by blocks concept and conversion fee are all ghastly concoctions of banks in Singapore that over time became ingrained market practice due to opportunistic nature of the banks, not technical limitation. For example Citibank in Malaysia allows conversion of their Thank You points in exact numbers needed and without any conversion fee. Yep the miles here are terrible. I can get 100,000s of Velocity points in Australia through sign ups and card churning and transfer them to KF and not spend $1. Here I have to spend $7.500 for a lousy 11,000 miles – here’s looking at you Citibank. I can also transfer miles to other family members through Velocity pooling -> KF and not break any T&Cs – unlike KF and the banks here. Is Amex shafting it’s existing customers who signed up when promo was 15k miles for first $6k of spend? Did they take a page out of the UOB playbook?